I love Bonfire Night! There really is something special about gathering round in the (often drizzly) cold evening, while being warmed by a roaring bonfire and drinking hot chocolate or mulled wine. The childhood memories attached to Bonfire Night are immense! I grew up in Sussex, and boy do we take it seriously down there. From processions of burning martyr's crosses in Lewes to carnivals in Uckfield, Bonfire Night is a pretty big deal. One thing I've never gotten used to in Oxfordshire is the lack of processions at this time of year! Here in Oxfordshire, we usually go to a couple of local village displays rather than the bigger displays, so we can get close to a bonfire and see people we know. One thing that always amazes me is how impressive the fireworks are, they usually go all out! Watching them while sharing a flask of warm hot chocolate together is pretty awesome. Since we don't eat refined sugar or dairy, we are used to bringing our own drinks, and this year I've been unable to decide whether to bring mulled wine or hot chocolate. In a flash of inspiration I decided to blend the two, and created a delicious mulled hot chocolate- a winning combo that is rich and chocolatey with all the flavour of the mulled spices while being alcohol free! Perfect for the whole family. My favourite chocolate to use in drinks is Hasslacher’s. It is amazing quality pure, dark, roasted and unsweetened chocolate, that comes as a block, flakes or little disks. It is easy to find now, our local Saisnburys has it as well as our local heath store. I really recommend you search it out, but if you can't find it, use a good quality cocoa powder instead. Melt the chocolate in a pan on a gentle heat. When melted, whisk in the milk. Bring the heat to a rapid simmer and add the rest of the ingredients. Reduce heat to a low simmer for 5-8 minutes, whisking to stop it catching at the bottom. Remove from heat, strain out the spices and serve warm. Photo bombed by Gink our kitten! I cannot believe what an exciting month this has been for me! To be in the final of PETA UK's 'Great Vegan Bake Off' and a nominee for Vegfest UK's 'Best Vegan Cook Book' is just mind blowing. I am so excited and so nervous that I've not had much time to be creative in the kitchen. That is until the girls insisted we have a Mexican night! We used to have Mexcian nights for dinner every Sunday, but over the Summer this slipped from our routine as we've been so busy, and hardly at home. But I was so glad they brought it up, and it gave me a chance to use up the delicious tomatillos that I got in our veg box last week. 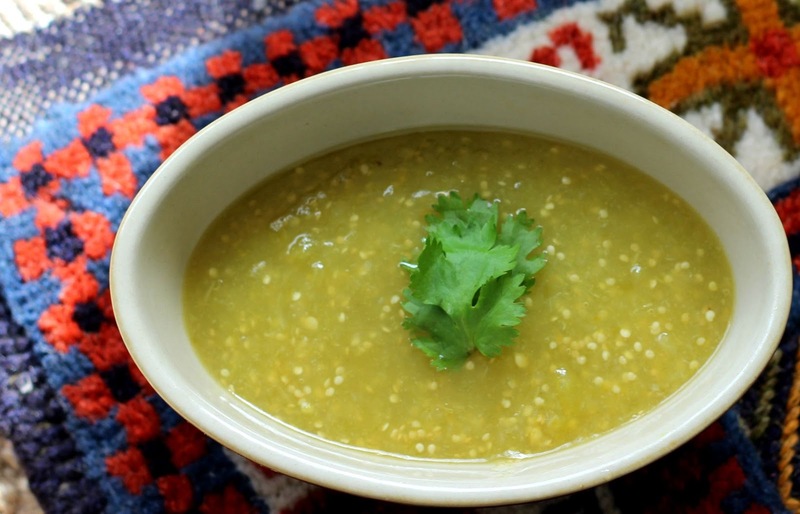 You don't come across tomatillos very much in the UK, but the good news is that this salsa works just as well with tomatoes. If using regular tomatoes, I like to add a squeeze of fresh lime at the end, it gives it that zing that you'd get with tomatillos. We'll be serving this up tonight alongside some slow cooked beans, rice, organic corn tortilla chips and fresh guacamole- I can't wait! If you guys have had a chance to vote for me in the bake off, thank you so much! 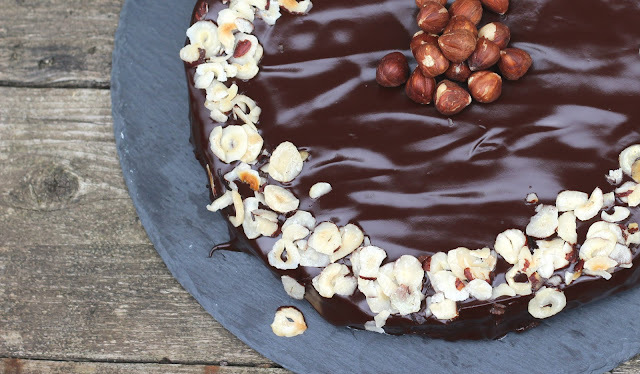 Votes close this Friday, so if you haven't I'd really appreciate you popping on over to The Great Vegan Bake Off to vote, lets get my sugar free Schichttorte on the map and show you can have your cake and eat it! Peel the husks off the tomatillos, and peel and quarter the onion. Add everything together in a saucepan, and simmer for around 25 mnutes, until most of the liquid has evaporated. Pour into a food processor and process to a smooth salsa. If using regular tomatoes, add a squeeze of lime at the end. That's it! It's the most simple salsa ever, but tastes amazing. So you know I love a challenge right, and as I've been away for so long, I figured I'd better come up with a real cracker of a recipe for you guys to make up for it! I've been watching the Great British Bake off, (as I do every year, in the hope somebody makes vegan bakes!) and loved that they had a dairy free, sugar free and gluten free week. This just shows how far things have come in the world of baking and it's very exciting- I hope next year they'll do a Vegan week, imagine how awesome that would be! A few years ago now, about six in fact, my family quit refined sugar. And everybody thought we were crazy. Forward to 2015 and Jamie Oliver is presenting a programme called 'Sugar Rush' and even my dear Dad is trying to cut down the sugars he has in his tea! Times they are changing and I couldn't be happier. While I am passionate about all vegan food, and am partial to the odd Taifun tofu hot dog, I maintain the belief that most of our diet should come from wholefoods rather than processed, and truly believe in ditching the refined sugar. My mission is to show that this doesn't mean you have to sacrifice taste and enjoyment of food as nothing is off limits, even cake! I make lots of gluten free recipes these days too, as I get many requests for them, and modern wheat just isn't what it used to be, it is, well, rubbish! I don't follow a gluten free diet myself as I include spelt, kamut, barley and rye into my diet, but I really like being able to offer alternatives to those who want them. It was quite by chance that on the same day, I noticed PETA UK was accepting entries to their 'Great Vegan Bake Off', which I took as a sign for me to enter. It is a little daunting to put a creation up to be judged though and I haven't taken this decision lightly, I am a little nervous! So like a crazy lady on a mission, I decided to go all out and give it my best shot, and that just has to be a vegan, refined sugar free, gluten free, multi layered, chocolate covered masterpiece of a cake, better known as a German schichttorte! I know this cake at first glance seems intimidating. Each layer is grilled individually to a nice golden brown creating something that looks like a cross between a stack of pancakes ad a cake, but it is not as hard as it looks I promise. Each layer needs just a couple of minutes under the grill, making it quicker than baking a standard cake (if you go for less than the traditional twenty layers that is), plus you never have the worry of it no being cooked through to the middle! I baked mine with six layers, because two were a little fat and I ran out of mix to make the eight I originally wanted. This batter mix makes the perfect amount for eight more even layers though, so if you are less heavy handed than me, this should be a breeze. The perfectionist in me wanted to make this cake again with perfectly even layers, but as I noticed this contest so late, I just didn't have the time. Plus it still tastes divine and I know you will all love it! 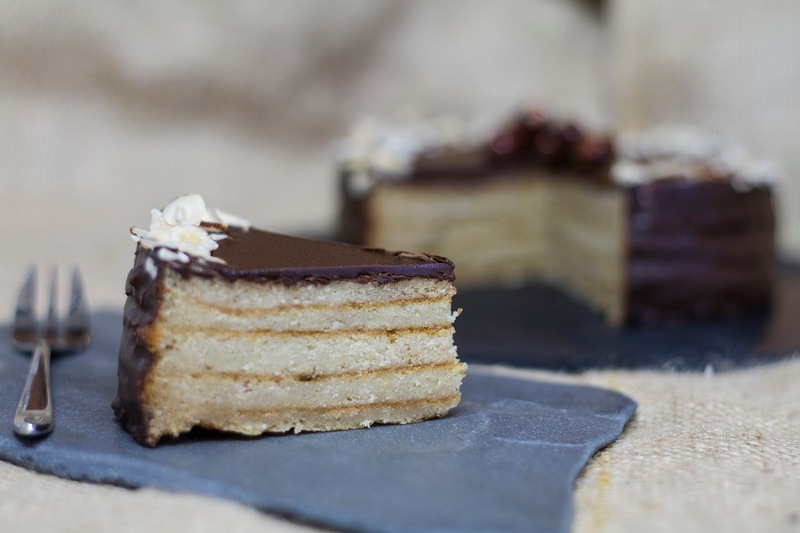 The first version I tried I made with coconut palm sugar, and while it tasted out of this world, and was described as 'the best cake i've ever eaten' by one of my daughters friends, you just couldnt see the layers as the coconut plam was too dark. So next I made it with agave nectar. 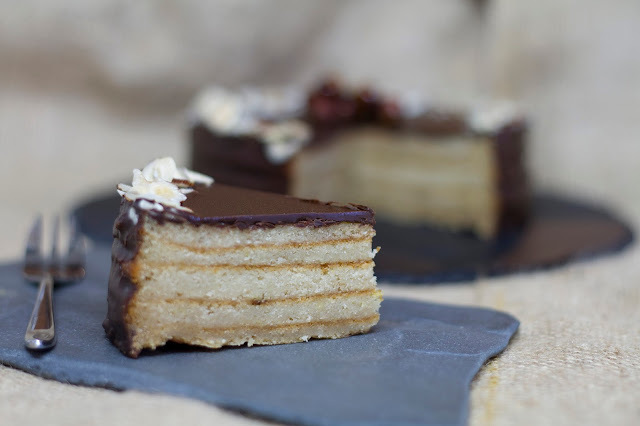 You can see the layers beautifully in this version, and it tasted like delicious, zingy, lemony, chocolate heaven! Though the texture is a little denser than when made with the coconut palm sugar, it was still kept light by using the latest vegan baking craze, whisked chickpea liquid in place of the egg whites! Whisked chickpea liquid is a vegan baking revelation and it works really rather well. I promise it is worth the effort! Grease and flour a 16cm lose bottom cake tin and preheat the grill to high. Set the whisked chickpea liquid aside while you make the batter. In a large bowl, beat together the agave and coconut spread until light and creamy. I like to use an electric whisk for this, until the day I convince my hubby to invest in a Kitchen Aid that is! Add the soy milk with the tapioca flour, the lemon zest and the vanilla extract and the sea salt. It looks like the mixture is seperating at this stage but it will come together when you add the the flour. Sieve the flour into the mixture and combine well. Next, with a large metal spoon, gradually add in the whisked chickpea liquid. You want to fold this in carefully so as to not knock out the air. When the whisked chickpea liquid is well mixed in, add a large serving spoonful to the cake tin, tilting the tin to spread the mixture into an even layer. Put this under the hot grill and cook for around two minutes, until quite dark golden on top. You need the top to be very brown so that the layers show up in the cake. The top of the cake tin should not be too near to the top of the grill, I had a good 10cm of space between the top of the tin and the grill. Continue adding a large spoonful of batter at a time, and grilling until all the batter is used up, it should make around 8 layers. When cooked, leave to cool for a few minutes before removing from the cake tin and transferring to a wire rack to cool further. While cooling, heat the apricot jam in a saucepan until just warm, and brush all over the cake. This helps the chocolate to stick to the cake. Next make the chocolate topping! In a glass bowl, set over a pan of simmering water, melt the chocolate together with the spread. Pour over the cake, smoothing it down over the sides until the whole cake is covered in delicious chocolate! Let set slightly, and garnish with the flaked hazlenuts or almonds around the edge. If you would like to make caramel hazlenuts for the centre garnish. Heat the coconut palm sugar in a pan with the water until bubbling, be careful as this stuff can burn. Let it cook for around 5 minutes before removing from the heat and cooling by setting the pan in a bowl of cold water. The caramel will start to thicken as it cools. Add the hazlenuts and stir to coat, transfer to greaseproof paper to cool, then pile them up in the centre of the cake. Voila! You will have an amazing centre piece for any party of get together, that will surely impress, as well as being pretty virtuous in the cake department. Who said you can't have your cake and eat it! We noticed that this cake tastes best on the day it is made, as it has a tendency to dry out if left overnight, but luckily left over cake isn't such a problem in our house! I would also like to thank a lovely guy named Matt, who lives near me, who came over to give me a crash course on inside photography and help take some of these pics for me! I have a lovely new camera now, and have started to learn the ropes. Boy oh boy is there alot to learn. If you want more tasty vegan and refined sugar free recipes, check out my book How to Eat a Rainbow! Available in the US from Vegan Publishers and in the UK from the Vegan Society and signed copies from Coles Bookstore. How to Eat a Rainbow has been nominated for 'Best Vegan Cook Book' Woo-Hoo! So excited! I would love it if you could vote for it at VegfestUK, it would man the world to me and help spread the message that healthy vegan food is delicious! Thank you. One of the things I love most about getting an organic veg box delivered to our door, is that lots of the veggies come with their greens still attached. This morning as I unpacked the box (while fending off the children who were grabbing cucumbers and tomatoes before I could even drag the box to the kitchen), I was super excited to see that my beetroot had an impressive bouquet of greenery on it. I adore beetroot greens and always wonder why you can't find them in supermarkets over here. Travel to the continent and you find these greens in abundance at local farmer's markets- clearly they know something that we don't! They are super mild in taste, a cross between chard and spinach and are packed with nutrients too, including vitamins A & C as well as calcium and iron. As I was pushed for time today (as always! 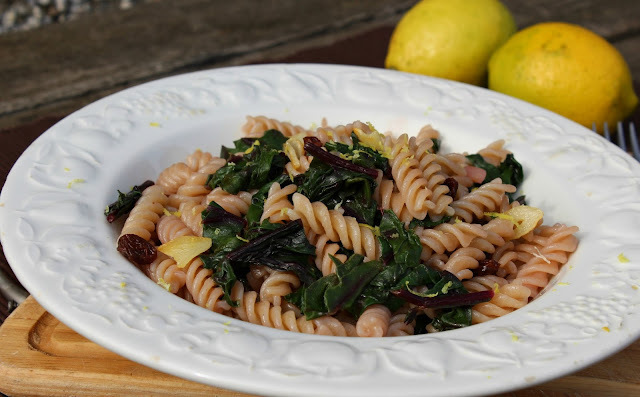 ), I decided to make these greens the star of a quick and simple pasta dish, along with some raisins that I had left in the cupboard. As I love to add garlic and fresh lemon zest to as many things as possible, I decided to add these as well. The combination of the earthy greens, sweet raisins, punchy garlic and zesty lemon was a match made in heaven. 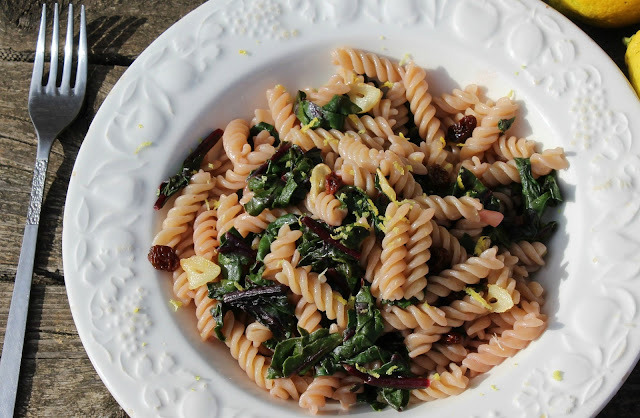 Simple, filling, nutritious and inexpensive, I am sure this will be a summer family favourite! Bring a large pan of water to the boil, and when boiling add the pasta and cook according to the packet directions. In a deep frying pan (I like to use a deep cast iron pan), sautee the garlic in the olive oil over a medium heat until it starts to turn golden. Add the beetroot greens, stiring until they just begin to wilt and release their juices. Add the rasins and cook for a further 8 minutes until softened, Season with sea salt. When the pasta is cooked, drain and add to the greens, mixing well. Grate the lemon zest over the top and serve immediately. As you guys may have noticed by now, I am a huge fan of the Indigo Herbs of Glastonbury company. I genuinely find that their products are of amazing quality and value and love discovering new products of theirs, and this one has indeed been a brilliant discovery. They sent me the Super Cleanse tea to review over the Spring, but with the colder weather we've been having, I've been stuck in hibernation mode and reluctant to give up on comfort foods and chocolate elixirs. Now that the warmer weather is here, it really felt like a good time to cleanse and try out this tea for you guys! "A cleansing, purifying tea that supports the body, and revives the hard working systems of elimination. This tea helps the body recover from over use of caffeine and other toxins. The delicious tastes of fennel, liquorice and ginger uplift the healing herby tastes of Dandelion, Nettle and Red Clover. Our Super Cleanse Tea Blend can be infused in boiling water and made into a delicious herbal tea drink." I tried this over four mornings in place of my regular green tea and I have to say that I was pleasantly surprised by the result. As well as being refreshing to drink first thing in the morning, I definitely noticed that I had less of an energy slump mid afternoon which was a huge bonus. You might expect the tea to be very herby with so many strong flavours packed in, especially with the bitter tones of dandelion and nettle, but it was far from herby or bitter. The liquorice comes through as a sweet aftertaste that was pleasant to drink and needed no extra sweetener added. I love that this tea contains whole clover and chunky herbs rather than being in powdered form, and as it comes in a handy re-sealable bag, I didn't notice any deterioration in the flavour over the days which was great. 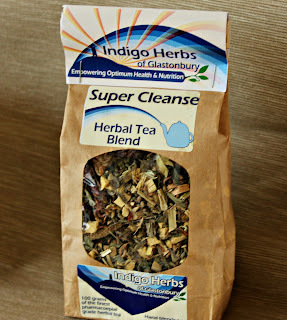 If a cleanse tea isn't what you fancy right now, Indigo herbs do a good range of herbs and tea blends so there is sure to be one that suits you, give them a try! So you guys, what a week! We've been sorting out the house and attending to all the neglected jobs over the years, trying to fit in all these home-school books and files we have acquired, moving my youngest into her 'grown up bed' (eeek my baby isn't a baby anymore!) and generally de-cluttering the place, and it's reached that point that even though we've sorted and sorted till we can't sort no more, the place still looks like a bomb has hit it. Anybody else been through this? My house is literally driving me crazy, but, I know the end is near and this is keeping me going... just. Amongst this craziness I also got a new camera. Finally I can stop having to rely on my wonderful friends to take pictures, or resorting to snapping them on my phone. I am so excited about this, though it really has been an eye opener for me. Until I got this camera, I had no clue how bamboozling the world of photography can be. I have a new lens and tripod on order and am very s-l-o-w-l-y getting to grips with the basics, so please bear with me while I learn. I can't promise you mind blowing pictures just yet, but surely they will improve with time. 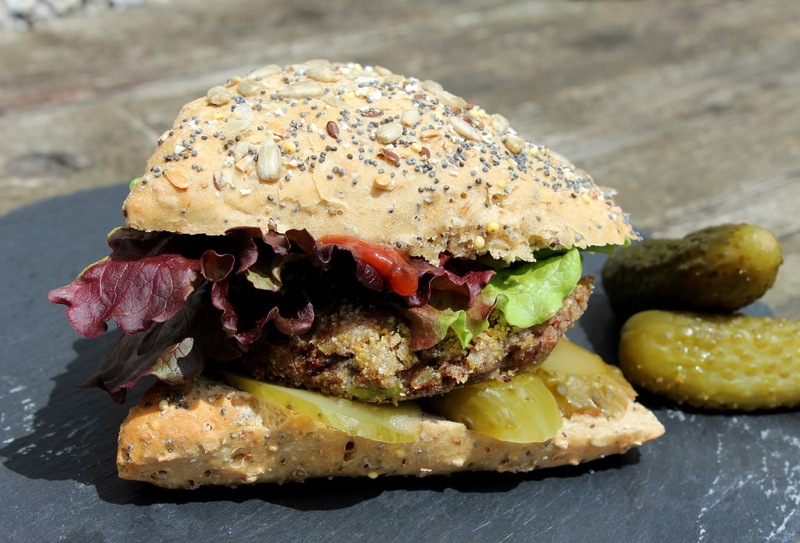 The recipe that is lucky enough to be my first photographed recipe (on a proper camera that is), is this tasty little vegan adzuki bean burger, because everybody loves a burger! But as much as we love them, they seem to cause some major challenges for the vegan kitchen. Getting the taste and texture just right, and producing a patty that doesn't fall to pieces when you cook it can definitely be a challenge and I have had my fair share of disasters. While I love this recipe for tasty tofu burgers, I know many people are uncomfortable with eating too much soy and I wanted to provide a tasty alternative. I was firmly in that camp for years too and avoided unfermented soy, but after more study into the subject, I am happy to include whole soy products now, including milk and yoghurt. I do always make sure it is organic and GM free of course, and I do stay away from soy protein isolate as that still makes me me uncomfortable, but whole soy products have been a welcome addition to my family's diet. But I am rambling. If you do prefer to avoid soy, this is the perfect recipe for you! Made with the tiny titan of the bean world that is adzuki beans, these are bursting with flavour as well as being super healthy. The burgers can be made completely oil free too, depending on your preferred cooking method. With a crunchy exterior thanks to the polenta and a soft interior, these burgers really work well in a toasted rye or gluten free roll, with all the trimmings of course. Just a quick word about the seasoning. I use 'Green Cuisine Chicken Seasoning' which is all natural and contains no sugar. This herb blend is a mixture of paprika, sage, parsley, thyme, cumin, pepper, garlic and onion. You could also use jerk seasoning for a spicy twist, or a tablespoon of harissa paste for a Moroccan influence. Basically spice these up any way you like them, there is no wrong choice here. Add your cooked beans along with the rest of the burger ingredients to a large bowl and mix with your hands. Really squish that mixure up, it's very theraputic! Next shape them into patties. This mix makes between 4-6, depending on how large you like them to be, I have actually found that 5 seems to be the ideal amount, which leaves one extra left over for lunch the next day. Tip the two flours for the coating on to a plate and mix together. With slightly wet hands, shape the burger mixture into nice rounds and coat each one well in the flour. You can now either shallow fry these in extra virgin coconut oil for around 5-6 minutes each side, or bake in a hot oven until crisp and golden. Serve these in a toasted bun of your choice, with lettuce, pickles and some home made tomato ketchup. *I cook my beans from dried with a piece of kombu in the water for added minerals and easier digestibility! 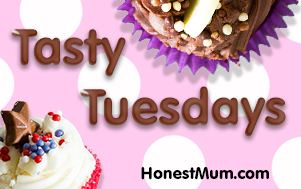 Super excited to link this recipe up to 'Honest Mum's' Tasty Tuesday! I was lucky enough to see this inspirational blogger speak recently and she is awesome. Loving reading about her vegan cleanse too, go Honest Mum! So June is finally here and along with it the start of the warmer weather. That definitely means strawberry season is upon us and I couldn't be more excited! I must admit though that I had delayed this post a little. When I began to write this at the start of last week, it felt as if we were in the depths of Winter again. Sharing a Summery recipe like this in a middle of a cold spell made me feel like a bit of a tease so I put it on hold. And while us Brits have never been held back by a little wind and rain (we'd never get anything done if we did! ), I decided to put my faith in the fact that Summer was just around the corner, and wait out the wind and the rain. Anyway, I am delighted that Summer finally decided to join the party, and even more excited to share this delicious recipe with you all as it really is delicious. The strawberries are an exciting addition to a green salad base and served alongside the sweet figs, fresh basil, earthy beetroot and crunchy macadamia nuts it makes for a hearty and satisfying combination. Strawberries and basil really are a match made in heaven! This strawberry salad is the perfect dish to serve up at barbeques and festivities as an impressive side, but enjoyed alongside some rustic rye sourdough, this also forms a substantial main in its own right. Heat a cast iron pan or heavy bottomed frying pan over a medium heat. Add the macadamia nuts and stir constantly until they are lightly toasted and golden brown. Remove from heat and set aside. Heat up a griddle pan to a high heat and lightly brush with olive oil. While it is heating, cut the figs into halves. Griddle each of the baby fig halves (cut side down) for a couple of minutes, until they just start to caramelise. Remove them from the pan and set aside. Now we're ready to assemble the salad. Wash the baby spinach, giving it a shake to remove any excess water. Add the spinach to a large salad bowl along with the fresh basil leaves. To prepare the rest of the salad, firstly cut the strawberries into halves. Peel the cooked beetroot (you can also use the cooked vacuum packed beetroot that is already peeled) and slice them into thin rounds. Add these to the salad bowl, along with the strawberries, macadamia nuts, griddle figs, and alfalfa and radish sprouts. Lastly make the dressing. Add the olive oil, balsamic vinegar, salt and pepper to a small bowl and lightly whisk to mix, or shake everything together in a jar. Just before serving, pour the dressing over the salad and mix well with a pair of salad tongs. After sadly losing our beautiful 9 year old cat, Chaak (named after the Mayan rain God) we were all a little heartbroken. It seems he and his brother both had some sort of hereditary heart disease or blood clotting issue that meant we have lost them both to thrombosis, way before their time. So goodbye little Chaakie, we hope you're having a wonderful time up there with your brother Jaguarundi, we miss you both so much! 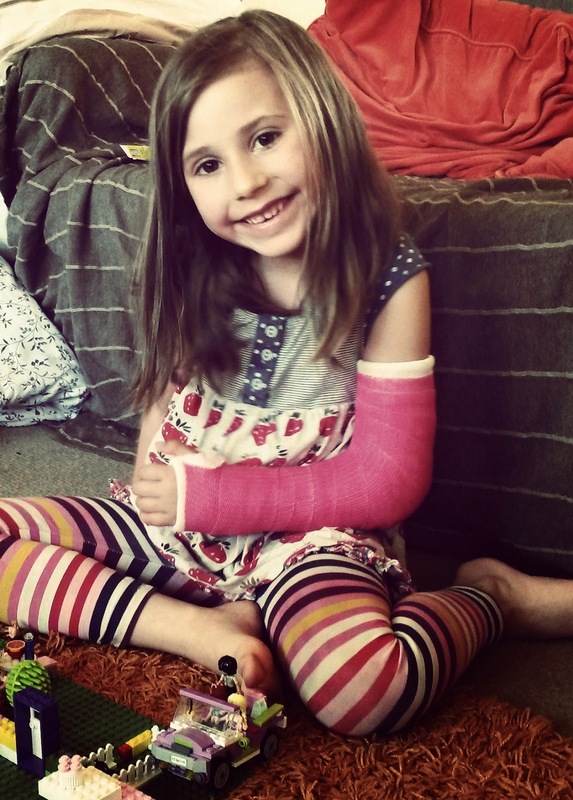 So as we started to get back to normal at home, my youngest daughter went and broke her elbow rather spectacularly, while trying to hurdle a space hopper, at great speed, on the patio. I have since praised her for her bravery and told her it's great to try out these things, but perhaps hurdling a more stationary object is a better idea in the future... She's been incredibly brave and I am amazingly proud of her. And through it all she is still smiling! While my youngest has been playing daredevil with a space hopper, my eldest has been saving trees! We live in an area that is being rapidly re-developed, and sadly as part of this, a beautiful line of trees that ran behind our back fence were cut down to make way for new houses. 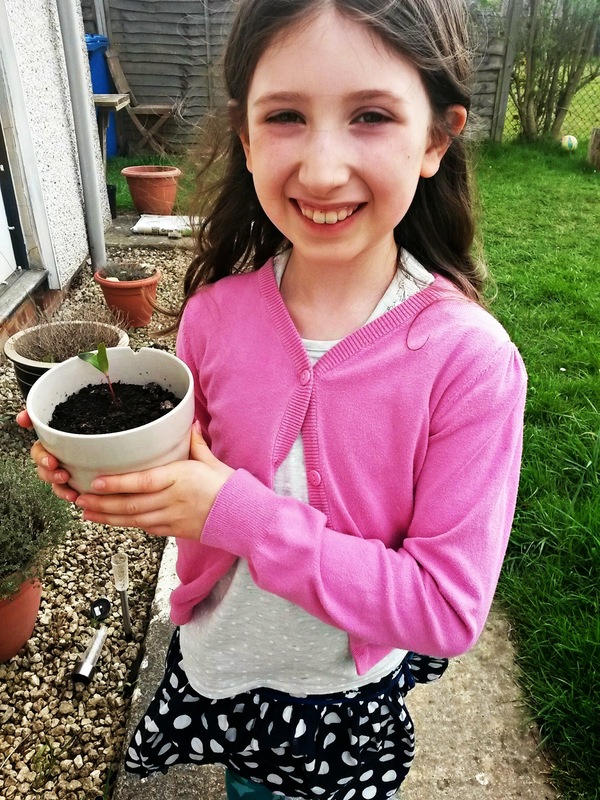 We were all saddened by this, but little did I know that my daughter had saved one of those little helicopter seeds from the tree and she had planted it in a pot. A couple of weeks ago, she proudly presented me with this, it's growing! Last weekend, a month after losing Chaak, we adopted a new rescue kitten- hooray! His name is Gink and he is rather special. He is so friendly and at only 3 1/2 months old, he is already a real lap cat. We have one small problem though. Our 3 year old girl cat, Chia, has turned into a hissing, spitting, crazy cat. 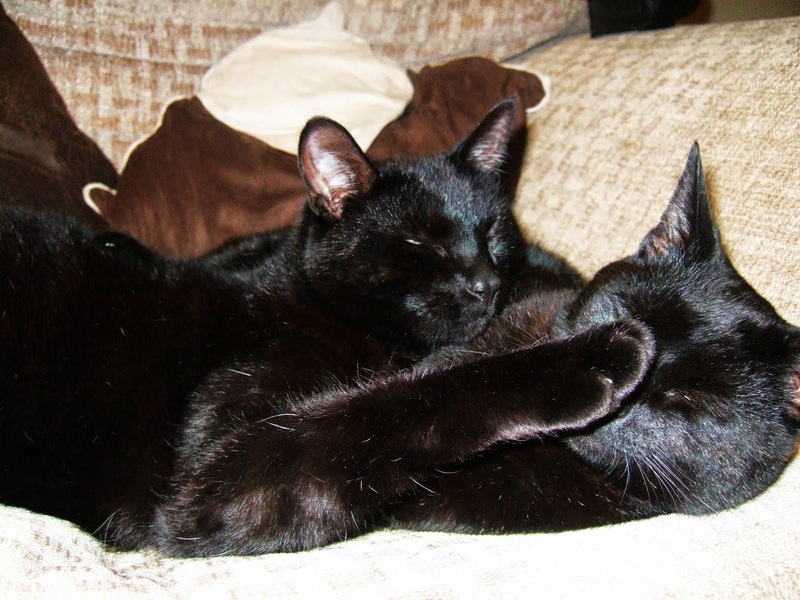 She'll even hiss at us if we smell like the kitten! Eeek. So any advise on helping these two get along would be greatly appreciated. Same could be said of the girls really... (kidding! Kindda). So that's been the last few weeks, a mixture of highs and lows and lots of busy in between. As a result, we've been cramming in the smoothies and juices this week, to boost our energy and for a quick and easy snack or brekkie. One we are absolutely loving is this butterhead lettuce and grape smoothie. We're getting lots of butterhead lettuce in our vegbox, and it tastes delicious in a smoothie. We've used frozen grapes as the girls really love them and I keep a bunch in my freezer, but any soft fruit would work. Blend everything together until creamy and smooth! I don't think I've ever reviewed a tea before, then in the space of a few weeks, I have three wonderful tea discoveries to share with you! They're all very different, so I hope that there will be a tea to suit everyone. I'm going to start the tea reviews rolling with this delicious olive leaf tea from Mirabilia. 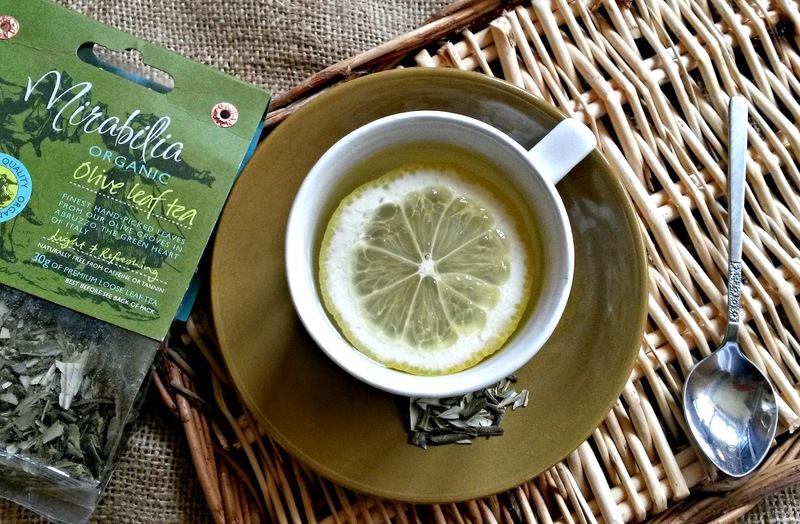 When Mirabilia olive leaf tea sent me some of their delicious tea to sample, I was super excited! My Mum had brought me some olive leaf tea a few years ago and I enjoyed its light taste, but really had no idea of its health benefits. I drink a lot of caffeine free alternatives to green tea, and many of them rival the antioxidant properties of green tea, such as hibiscus or red bush, but somehow olive leaf had passed me by. When I read through the information that they sent with the tea, and found out the many benefits, I couldn't wait to start drinking it. Mirabillia olive leaf tea is made from organic green olive leafs. Bimbi and Kim set up their business in Italy believing wholeheartedly in a local sustainable approach to producing the tea. I am a huge believer in using local foods wherever possible so this was music to my ears. As some of you who have watched my talks and demos will know, when I first started living the wholefoods and raw foods life I embraced the exotic, weird and wonderful worlds of superfoods with passion and wonder. But over the years I began to realise that we have the most amazing and powerful superfoods right here in the UK and also closer to home in Europe. Where I could, I started making changes in our diet, replacing more exotic foods with local alternatives and foraging for wild foods. Knowing that I am doing my bit for the environment is a great thing. I'm not saying never eat any exotic foods (I cannot give up chocolate and bananas just yet! ), but it does make sense to include as many local foods as possible. For as well as the environment to think about, we have our health to consider, and the foods grown closer to home, which are more climate appropriate, tend to be better suited to us and better at keeping us in balance. How awesome is that? The more I looked into the information they had sent me and from what I read on their website, the more I was excited by it's potential health benefits. Olive leaf tea has been traditionally used in Italy for many generations and studies have shown that it could be beneficial for blood pressure and weight loss, is anti-viral, anti-fungal rich in vitamin C and high in antioxidants. There are no known side effects and it is safe for all the family. "Oleuropein is active against bacteria and insect pests, thus protecting the olive tree. This property has also been found to help protect humans too. European researchers discovered that oleuropein was effective at lowering blood pressure as well as increasing blood flow. Research conducted in the late 1960's by scientists at major pharmaceutical company Upjohn (now Pfizer ) showed that an active ingredient from olive leaf tea called elenolic acid was very effective at inhibiting viruses from growing, including those associated with the common cold of humans ( the "Rhinovirus" family)"
Delicious! It has a very mild slightly "olivey" flavour, and a butter-like quality to it, making it very smooth on the palate. I imagine that this tea is just as tasty served chilled as it is hot and could be used as a base in cooking too. To prepare the tea, simply steep a pinch in some boiled water for around 5 minutes to get the maximum benefits. And that's it! I serve mine with a wedge of lemon in it and it's super refreshing that way, but it works amazingly well as the base of a nutritious hot chocolate elixir too! I am a huge fan of making hot chocolate elixirs, as a delicious and nutritious way to boost my nutrient intake. My elixirs have evolved over the years from containing exotic superfood powders and herbs, to making use of more local ingredients such as beetroot powder and rosehip. Last Saturday, I thought I'd give olive leaf tea a go as my elixir base for one of my demos at Vegfest in Brighton. 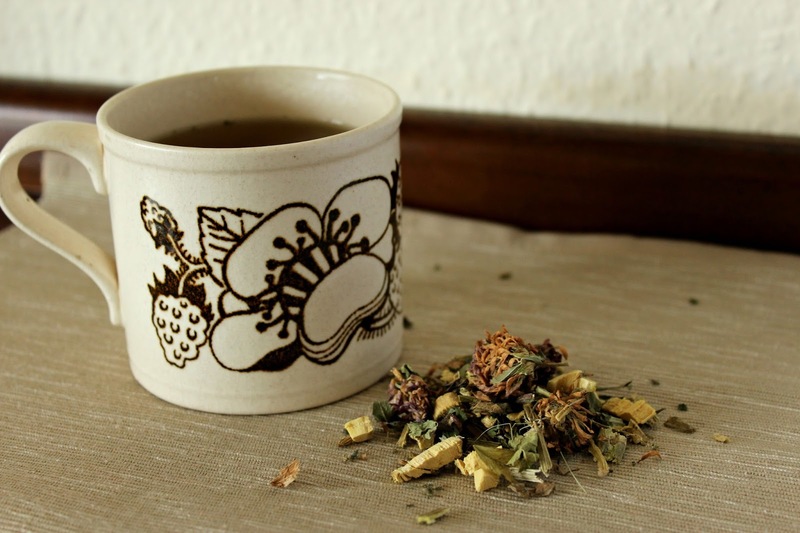 I usually use redbush tea, which is a fabulous tea for all the family and full of antioxidants, but I wanted to see if I could make this elixir using this delicious tea. It worked perfectly - I am excited to have another tea that I can use in the mix, and it's great to know the addition of olive leaf tea takes this elixir to a whole new level health-wise. I will definitely be buying this tea and making it a staple in our home. If you are interested in purchasing this tea, all the information, as well as where to buy it can be found on their website! 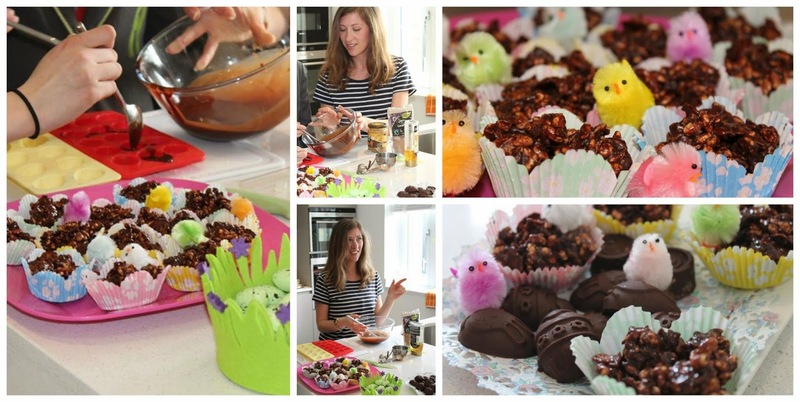 Refined Sugar Free, Vegan Easter Treats! Easter is approaching, and it's that time of year when the shops are full of sugary, dairy filled chocolates- so what's a Mama to do? Well, the good news is that chocolate can be delicious and healthy too! (in moderation of course!) Cacao contains many important nutrients including magnesium which is important for heart health, and is packed with antioxidants too. Of course we're talking chocolate in it's pure form, before the added sugar and the dairy and the emulsifiers and the rest of the stuff you get in regular chocolate bars. Good quality dark chocolate is the one to look out for, raw or roasted and preferably cane sugar free. The question that I get asked a lot is, what is the difference between raw cacao and cocoa, and does it need to be raw to get health benefits? I've been a fan of raw chocolate for a long time now, and it has become quite a trend these days! While it is a sure thing that it has a higher level of nutrients and antioxidants that the roasted cocoa bean, it is also true that roasted cocoa still packs a huge punch when it comes to antioxidant levels (though try to choose one that hasn't been dutch processed, as this extra processing step, reduces the antioxidants further). Some people (my daughter included) tend to notice that raw cacao has an effect on them more than the roasted kind, so I think it is down to personal choice which you use, so go have fun and experiment with them! A couple of weeks ago I had a blast teaching some pupils from our local school how to make super healthy Easter treats at the beautiful Dorchester Show Home! We made crispy cakes and raw chocolate eggs filled with peanut butter. I was a little nervous, as many children are so used to the milky kind of chocolate, I wasn't sure how they'd like this pure raw dark kind, but I needn't have worried, the chocolates were a great success! So much in fact, that I wanted to share the recipes with you in time to make them for Easter! These crispy cakes taste just like the traditional favourite, only they are dairy and refined sugar free! Break up the chocolate, and add to a pyrex bowl with the coconut oil and agave/maple syrup. Place the bowl over a saucepan of simmering water, and melt together, stirring frequently. While melting, add the cornflakes, rice puffs and dessicated coconut to a bowl. Pour the melted chocolate mixture over, and stir well to make sure everything is coated in the chocolate. Spoon the mixture into cup cases, and pop in the fridge to chill for a couple of hours! Making raw chocolates is easy. The raw cacao powder is packed with nutrients and being refined sugar free, these chocolates are good for you as well as delicious! Cut any large pieces of cacao butter up (to make it easier to melt), and add them to a pyrex bowl. Place the bowl over a saucepan of simmering water, and whisk until melted. Split the vanilla pod in half, and scrape the seeds out with the back of a knife. Add the vanilla seeds to the cacao butter along with the agave syrup and cacao powder. Whisk well until evenly mixed and no lumps! Fill the chocolate moulds with half of the melted chocolate. Add a quarter of a teaspoon of the peanut mixture to each, and then top with more melted chocolate to cover. Set in the fridge for a couple of hours, or in the freezer for 30 minutes. Photo credit Dorchester Living 2015. If I had a pound for every time somebody asked me what on earth I ate, or asked 'how could vegan food, without refined sugar actually taste good? ', I'd be a super rich lady! Part of why I blog is to set the record straight, to show people just how amazing vegan and refined sugar free foods really are, and how it really doesn't mean missing out. From homemade cakes and scones to creamy caramel chocolates, fresh pancakes with maple syrup or steaming mugs of hot chocolate, we enjoy all sorts of sweet treats at home! I do believe these foods should be treats, not really everyday foods, but of course we indulge every once in a while. I encourage everybody to explore the tasty vegan and refined sugar free alternatives that are out there; you'll be surprised how tasty and decadent the results can be. Take this rich and creamy 'cheesecake' for example. I know technically its not a cheesecake- it has no cheese- but it does mimic the taste and texture of one and for want of a better name, I'm sticking with cheesecake! This dessert is vegan, gluten free, refined sugar free and raw so is pretty impressive on the health front (for a pudding anyways) but lacks nothing on the flavour department I promise. With Easter just around the corner (and it is all about the chocolate!) this is the perfect dessert to serve at a family gathering; and I bet, if you didn't say anything, they'd never know it was vegan or refined sugar free! To make the base, blitz together the almonds and dates in a food processor until the mix starts to come together as a dough. You can test if it is ready by squeezing some of the mix between your fingers; if it sticks together it is ready. Tip the mix out into a 15cm diameter loose bottom (or spring form) deep cake tin and press down evenly to create the crust. Next make the filling. Add all the filling ingredients to a blender and blend until creamy and smooth. This will take a few minutes and requires stopping the blender several times to scrape down the sides to be sure to get all the lumps out. The finished result should be smooth and creamy like a very thick custard. When it's smooth enough, pour the filling over the base. Gently tap the tin to level out the top and place the cheesecake in the fridge to set overnight. When it is set, carefully remove from the tin and garnish with grated chocolate for an impressive finish! Tomorrow is St Patrick's Day, and at this time of year bloggers rejoice as they post their green culinary delights! It's a wonderful time to get creative, but sometimes it can all get a bit out of hand... My hubby is American and St Patrick's day is widely celebrated over there. He once told me how he and his best buddy dyed his Mum's kitchen green with food dye while creating a St Patricks day feast. The food they were colouring was pasta with hot dogs, I really cannot imagine what they were thinking! So, assuming like me, you think the idea of green coloured pasta is a bit gross, I am presenting you with an alternative that I think that you'll love! 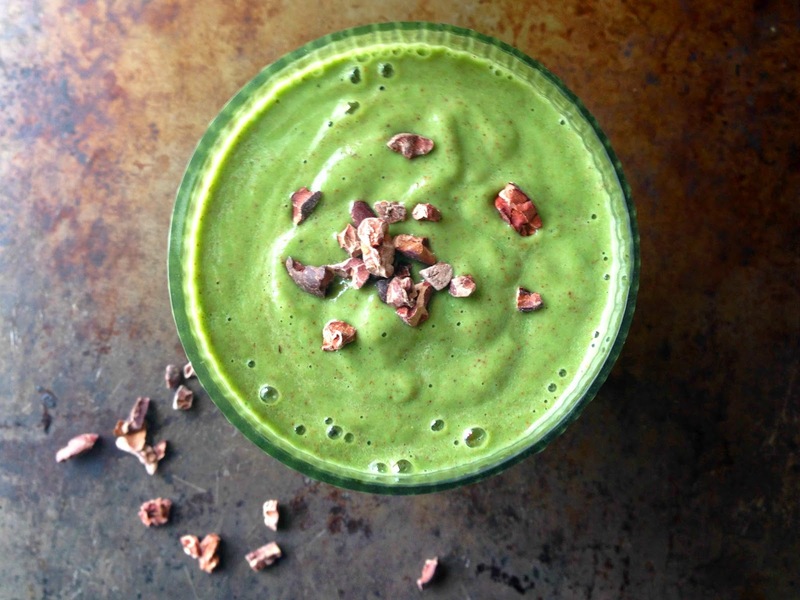 This green smoothie is not like any other green smoothie out there. Mainly because it contains frozen peas! Nearly everyone has frozen peas in their freezer, and they make a surprisingly tasty smoothie when combined with zingy fresh mint and crunchy cacao nibs. Peas and mint were literally made to go together, there is nothing new about this combo- think hot peas with fresh garden mint- but I hope I am presenting a vibrant new way to enjoy this match made in heaven. Using frozen peas straight from the freezer brings a nice icy chill to the smoothie, which when combined with ripe avocado becomes creamy and dreamy, just like mint choc chip ice cream. The peas are naturally sweet and protein packed, which makes for a great post workout smoothie, without having to rely on processed protein powders. The sweetness of the peas, dates and coconut water is balanced with the bitter cacao nibs and the mint, making for a perfectly balanced taste. This recipe works best with fresh mint, but I have also tried it with an unsweetend peppermint extract which was super delicious too. But first, a word of caution. Before you all rush to throw frozen peas into your blender, it is worth pointing out that some brands of frozen peas state that they should not be eaten frozen, but must be cooked before use. I have tried to think of a possible explanation for this, but I really can't! Peas can definitely be eaten raw, and I see no reason why this warning should appear on certain brands, other than maybe it is something to do with the manufacturing process? As I do not know the reason, I cannot ask you guys to ignore it. I buy organic frozen garden peas, and they have no warning on the pack, and I have used these in smoothies for years, so look out for an organic brand and check the pack. If your brand does have a warning on it, then it's probably a good idea to look for a different one for this recipe. I have added Spirulina to the mix as it improves the green colour, adds extra vitamins and minerals (including B1, B2, B3, B6, calcium and iron) and a little more protein punch to the smoothie. I also find that when I include spirulina it gives me an amazing energy boost! If you love the taste of spirulina, feel free to up the amount to a teaspoon. If you don't like the taste of Spirulina, try replacing it with wheatgrass powder, or even leaving it out altogether. The smoothie will most definitely still be green. The Spirulina that I am using today is organic and available from Indigo herbs. It is one of a collection of yummy ingredients that they sent me to review and get creative with! The products I received as part of their vitality pack were; organic Spirulina powder, organic raw banana powder, acai berry powder, organic wheatgrass powder beetroot powder and supercleanse tea. To see how I used the banana, acai berry and beetroot powder, check out my delicious raw rainbow cake recipe! As with all the other products that I have tried from Indigo Herbs, the Spirulina is of a really great quality. It is darker than other brands I have tried and the taste is not too overpowering, although I find you still only need a small amount. 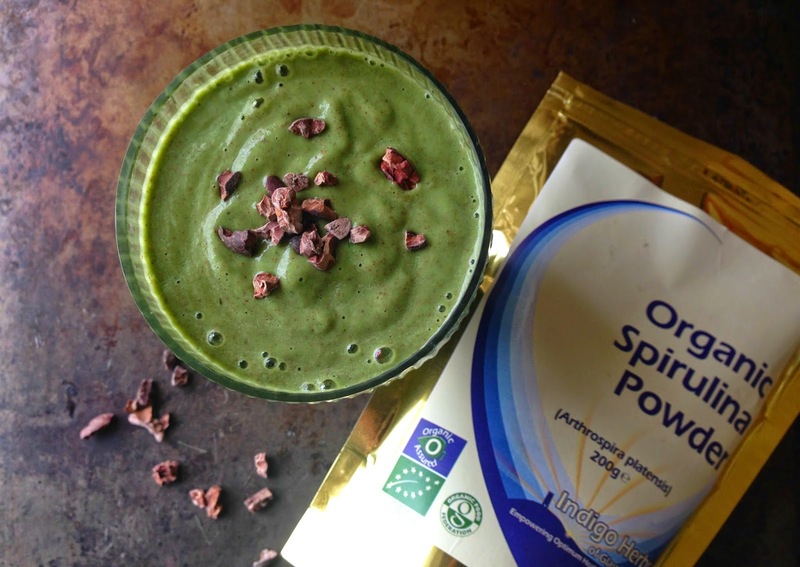 To buy this organic spirulina powder, check out this link! Simply blend all the ingredients together until you have a smooth, creamy finish! Finish with a sprinkle of cacao nibs if you desire. When I was little my Mum often made drop scones for me which I absolutely loved! Also known as Scotch pancakes, they're smaller than the American style pancakes. 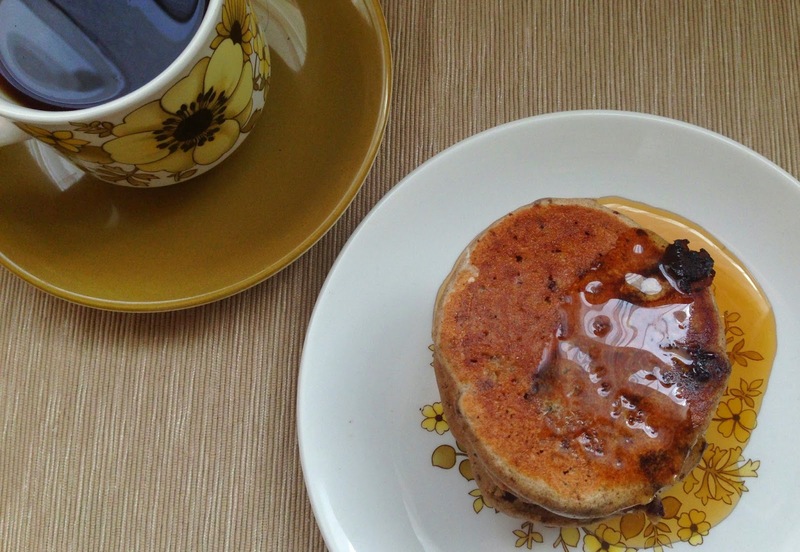 Instead of being eaten covered in maple syrup, they were usually spread with butter and jam or very sticky golden syrup, so that they can be eaten like a crumpet (with your hands) rather than with a knife and fork. As it's Mothers Day tomorrow, and these remind me of my Mum, I think these little drop scones are the perfect thing to make on Mother's Day. I'm sure any Mum would love to have these made for her for breakfast, me included (hint hint)! Being married to an American, we have a huge love for maple syrup in our house, and I do like to serve these up American style. These little drop scones are made a little thicker, with added chocolate chips and a drizzle of Maple syrup, though I'm keeping them true to their original mini size; the perfect mix of traditional English and American. For the chocolate chips, use a good quality dark chocolate that is preferably refined sugar free, we love Plamil which is sweetened with xylitol and found in Holland and Barrett. Just to make these little drop scones as virtuous as possible, they are made with a blend of wholesome gluten free flours which lend a delicious nutty taste, and of course they are vegan too! Pre-heat your pan to a medium high temperature. The secret to good pancakes of any kind, is a nice hot pan! Let it heat up for a good 5 minutes, then prepare the batter. Add all the dry ingredients to a large mixing bowl, add the lemon juice or apple cider vinegar and oat milk and whisk till smooth. You'll have a very thick and smooth batter. Cut the chocolate into small chunks to make 'chips' and stir into the batter. Take a little knob of coconut oil and add to he hot pan, swirling it round to coat. I use a ceramic pan and it makes amazing pancakes! Using a 1/4 measuring cup, scoop the batter, dropping it onto the pan. I can make 4 at a time, but it depends how big your pan is! Cook for around 3 minutes, until you see little bubbles appearing on the surface, flip them and cook for a further couple of minutes. 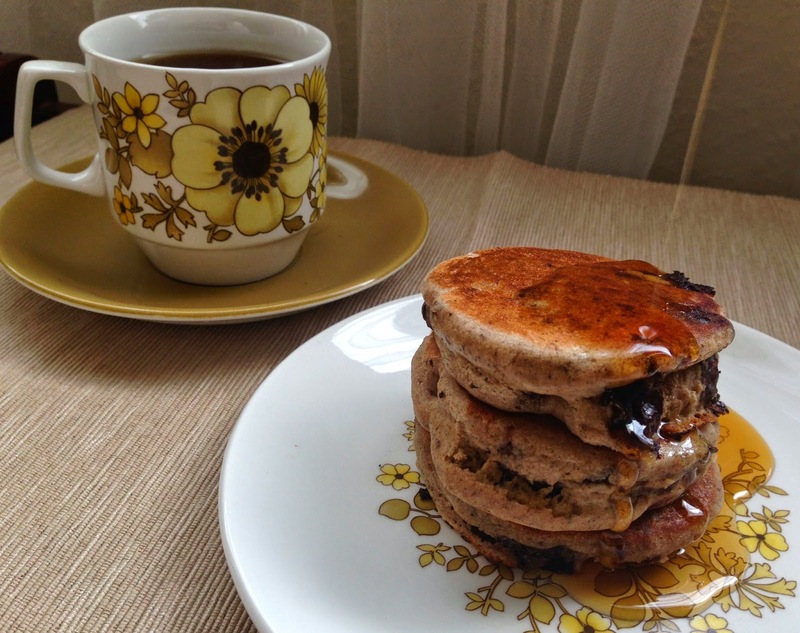 Serve with maple or coconut syrup for the perfect Mother's Day breakfast! Love sushi but don't have a whole lot of time to make it? Then sushi bows are the answer! These little bowls of rice and veggies are packed with flavour, take hardly any time to make and are super nutritious. We absolutely love making these and they have become a staple in our home. You can pretty much top them with anything you like, both cooked and raw toppings work well. Baked sweet potato cubes are heavenly as a topping with avocado and spring onion, and the more colours you can add in there, the better. This recipe packs in lots of crispy and fresh raw veggies and some smoked tofu for a different texture, but you could substitute the tofu for cooked beans or chickpeas, or skip it all together and just load up the veg. Go and have fun with it! Cook the rice according to the instructions on the packet. 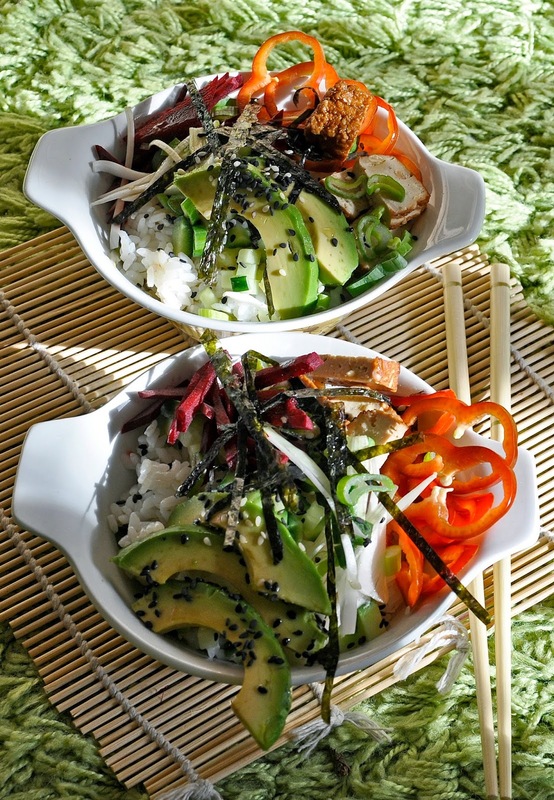 When the rice is cooked, tip it out into a bowl, and add the brown rice vinegar, mixing well with a fork. Leave the rice to cool slightly while you prepare the veggies. First, cut the cucumber, bell pepper, beetroot and spring onion into small dices or fine matchsticks. I like to use a mixture of both to create a fun variation in texture and look, but it's completely up to you, go with whatever your heart desires! Next, scoop out the avocado flesh with a spoon and cut it into slices. Set this aside with the rest of the chopped veggies. Cube your smoked tofu, and lightly sauté in a pan with a little olive oil if you like, to make it crispy. I often skip this step if I'm in a rush, it tastes great cold too and makes for a speedy lunch this way! 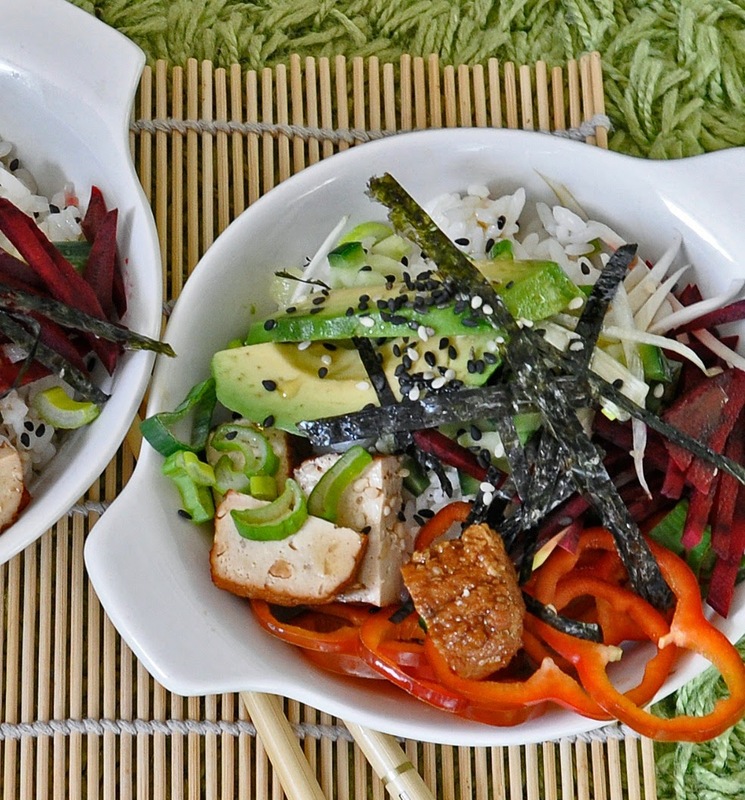 To make the sushi bowls, split the rice between two small bowls and divide the veggies and tofu equally over the rice. Finish with a sprinkle of sesame seeds (I like to use both black and white sesame seeds as they look pretty, but use whichever kind you have to hand) and the tamari and sesame oil. Lastly, take the sheet of toasted nori, and cut it into thin strips with a pair of scissors. Sprinkle this over the top, it looks pretty and it gives it that authentic sushi taste. *We like Taifun smoked tofu with almond as its delicious straight from the pack, no need to cook! Photographs copyright of Chris Mullineux 2015. It was my Birthday a couple of weeks ago and the only downside of being the cook in the house, is that I usually make my own Birthday cake! It's not all bad though, it gives me a chance to experiment, and create new recipes which I might not have made otherwise. This year I made the prettiest little rainbow cake, a total retro looking masterpiece (gotta love that retro vibe) which also happened to be packed with super-foods. A pretty cake, that is pretty good for you! When I was sent some fruit powders from Indigo Herbs to test and review, I just knew that they'd be perfect in my rainbow cake. The powders are really vibrant and packed full of nutrients. For this cake I used the beetroot, acai berry and banana powders. I use beetroot powder at home a lot. It's really amazing the energy boost it can give when added to smoothies and hot chocolate elixirs; it can be pretty powerful stuff! Acai berry is a deep purple fruit that is native to central and south America and is said to have the highest antioxidant levels of all the berries. Again, it can easily be added to smoothies and is great added to desserts for an antioxidant boost. 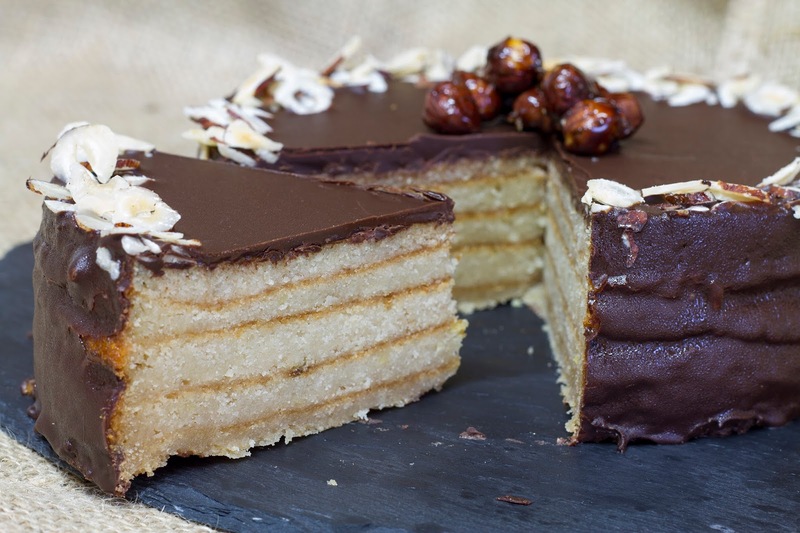 The banana powder was totally new to me and this cake was my first recipe creation with it. I love discovering new ingredients! It worked so well, that I plan to make a raw banoffee pie using it. This banana powder is packed with fibre and is a great way to boost your daily intake. I can imagine that it tastes absolutely amazing stirred into porridge for breakfast, I will be trying that out soon. As always with Indigo Herbs, the products are amazing, this company constantly impresses me with their commitment to quality. I had wanted to make a healthy version of a rainbow cake for the past year (I am the author of 'How to Eat a Rainbow') so it seemed an obvious challenge! ), so my birthday was the perfect opportunity. My original vision was to have five coloured layers, but with friends coming over and a photographer coming to shoot the cake, time was of the essence, so I settled on four, which still looks impressive. When I make this again, I'll go for the full five layers, and perhaps darken the green layer a little more with a 1/4 tsp barley-grass powder. At this point I must say that I cannot take all the credit for this cake. See, I saw a post from the lovely Emily from This Rawsome Vegan Life, for a marshmallow cream cake. Her lovely layer cake looked so beautiful, and the texture she described as being like marshmallows which really got me curious! Her secret was adding in some chia seeds to the mixture, which I thought was a fabulous idea. Emily stirred hers in at the end, but I chose to go ahead and see what happened if I blended them up with the rest of my usual cheesecake ingredients. The result was more silky than marshmallowy, but that is totally ok with me, it was amazing, much lighter than the regular cashew cheesecake texture. It was positively melt in your mouth in fact. So thank you Emily for the inspiration! Simply blitz the ingredients together in a food processor until they make a dough. Press this into a 16cm/6" deep lose bottom or springform tin. Set aside. Blend up all the ingredients for the main filling until creamy and smooth. You'll need a high powdered blender for this, like the Enpee. Divide the mixture between 4 bowls, as evenly as possible, but don't stress it too much, it doesn't need to be exact! Next, blend up one of the bowls of the main filling, with the layer 1 ingredients until well mixed and smooth. Pour over the base and give the tin a little tap to ensure the layer is spread nice and evenly. Pop it into the freezer for 20 minutes. When nicely chilled, blend another bowl of main filling ingredients with the layer 2 ingredients. And repeat as above. Follow the same steps for each of the bowls of main filling and the layer ingredients until you have filled the cake tin with all four layers. Pop it into the freezer for around 4-5 hours to set. Remove from the freezer 20 minutes before you wish to serve it, so it is easy to remove from the tin. It should still cut easily and not be too frozen, but you can leave it out a little longer if you prefer to get that silky texture. I left mine out for 40 minutes and it was deliciously silky and not at all frozen. *Crispy sprouted buckwheat available from the health shop chain 'Graptree' or you can find online. Photos taken by Emma Lou Cowell. I love pizza, who doesn't? With home made vegan cheese, or even without the cheese, its always yummy, but I always put tomato sauce on it. I'd heard about white pizza before, but pizza without the red sauce just sounded incredibly wrong somehow, and I just wasn't ready to go down that route! So when I really fancied pizza for dinner the other night, I stared at the (almost) empty cupboards and faced a dilemma. There was definitely no passata in there, and no passata meant no pizza sauce. We live in the countyside, and so it's not as simple as 'popping to the shops' when I need something. It sometimes drives me crazy that we have to drive miles to get to anywhere- it is one of the downsides of living in the middle of nowhere- but it is beautiful so I shouldn't complain too much! Anyway, if we were going to have pizza for dinner (and I was pretty determined we would, because the girls would get mad at me if we didn't), it was going to have to be pizza without red sauce. I went to get one of my recipe books, that I'd once seen a recipe for the fabled white pizza in. The book in question was 'Vegetarian Planet' by Diddi Emmons, which was given to me by a lovely friend of mine. It's a wonderful book and It's been a useful addition to our home. 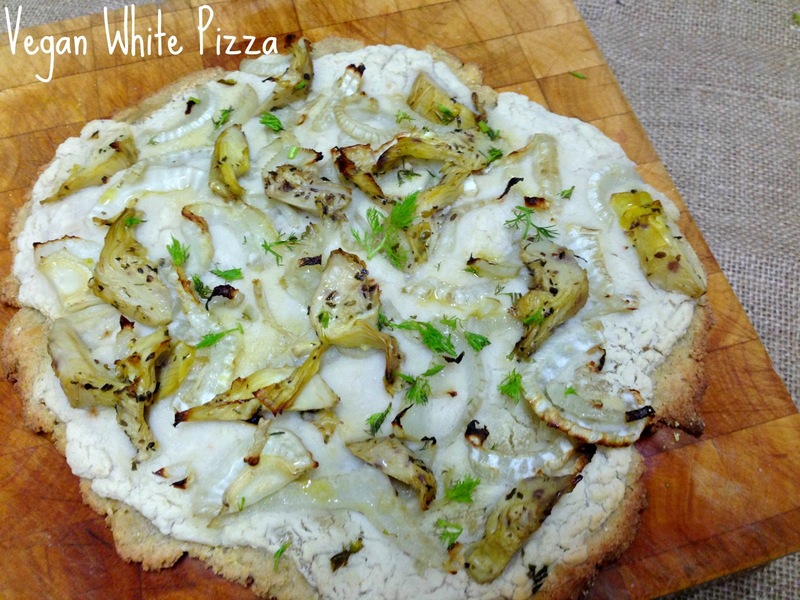 I turned to her recipe for 'Fennel pizza with white-bean puree' and, pleased that I had all the ingredients I needed to make it at home, I decided now was the time to face my fear of the white pizza. And you know what? It was SO good! I don't know why I didn't try it sooner. I did make some minor changes to the recipe (I can't help but play with recipes). The original recipe calls for a regular pizza dough, and I prefer using gluten free grains when possible, so I whipped up a batch of gluten free dough. It's a rather rustic dough as you can see from the picture, and it's hard to get it looking perfect and round. But, it is light and delicious, and pretty easy to make too. Of course you can use any pizza or bread dough you like! The topping was also altered just a little. I added a little more of a flavour boost by finishing it with a jar of marinated artichokes, and some of the herbed oil from them made a good addition to the bean puree, along with some roatsed garlic.Artichokes are amazing on pizza, they really are made to go on it. So here it is, I hope you enjoy! Add all the ingredients together in a mixing bowl and mix well to form a very sticky dough. Cover the bowl with a tea towel and leave in a warm place to rise for an hour. When the dough is half way through rising, prepare the fennel. Finely slice the fennel and put into a tray with a drizzle of olive oil. Add the unpeeled garlic cloves, and roast for around 20 minutes in a hot oven (180-200), until the fennel is soft and colouring at the edges. Take your risen dough and split it into two. With lightly oiled or wet hands, spread the dough out onto two lightly oiled baking sheets, that have been sprinkled with a little polenta or cornmeal, to prevent sticking. Put into the hot oven for 5-8 mins until just starting to cook through, remove and set aside for topping. Puree the beans with the water, the roasted garlic cloves (remove skin first), salt, pepper and 2 tbsp of reserved herbed oil from the artichoke. Divide the bean mixture evenly between the two pizzas and spread so it covers the pizza evenly. Top with the fennel and artichokes. Cook for 10 mins until pizza is golden around the edges and dough cooked through. Top them with the fennel herb (fresh oregano or basil would also be lovely) and a drizzle of extra virgin olive oil and a sprinkle of sea salt. Nori Wraps for busy days! Right now things have been totally crazy for me. So when in an ideal world, I'd plan every meal very thoughtfully and carefully, these days it just isn't happening as much. Nori wraps are pretty much my saviour when it comes to emergency meals. Great for lunch, snacks, even at breakfast time, I know I can usually whip up something pretty tasty when wrapped in these little nori sheets. They're great for families too, as each family member can create their own filling, it's like a health upgrade on a regular sandwich and is great for kids to get creative with - let them go wild! Leftovers almost always work in these wraps, both cooked and raw. I made a roast dinner wrap last week, with leftover roast potatoes, lentil loaf and sage and onion stuffing. I threw in some crunchy red peppers and a bit of rocket to liven it up and voila, the roast dinner wrap was born. I was so rushed that day that I didn't even photograph it - sorry, next time I will I promise! This one is one of my favourite wrap fillings. An Italian style wrap that is bursting with flavour and its pretty simple to make too. All the ingredients are things that I usually have in my cupboards and fridge, and it tastes great with some leftover rice thrown in there too, if you have any. The Italian inspired dipping sauce really compliments the flavours of the wraps, and can be spiced up if you like with some fresh chopped birdseye chilies. First make the dipping sauce, it tastes better when made an hour in advance as the flavours can mingle together better, but if you don't have time that's fine too! 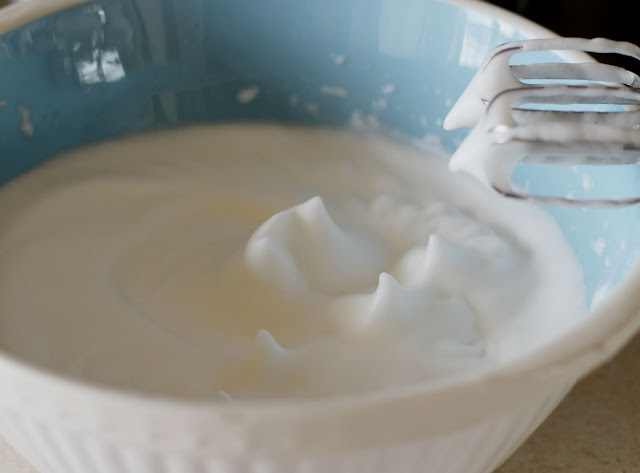 Add the ingredeints to a small bowl and whisk together with a fork until well combined. Assembling the wraps is easy. Divide the vegetables between the two sheets of nori, and wrap them up, making a cone shape so that you can easily hold the bottom without the filling falling out! First of all, I just wanted to say thank you so much for bearing with me while this blog undergoes a re-vamp. The transition from 'The Boo The Bear and the Goji Berries' to 'Ellie's Recipes' has been a bit more complicated than I thought (being no computer whizz) but I'm doing my best to get it ready and it's very nearly there! Things have been pretty crazy busy here. And when it gets like that I turn to comfort foods. I've always preferred savoury foods to sweet ones, and one of my favourite things to eat is scrambled ackee. I am totally obsessed with breakfast foods. I'd much rather go out to eat breakfast than dinner, though finding a decent vegan breakfast in Oxfordshire is no small thing! If you've never come across ackee before, its a kind of fruit native to West Africa, and very popular in the Caribbean. In fact ackee is the national fruit of Jamaica. 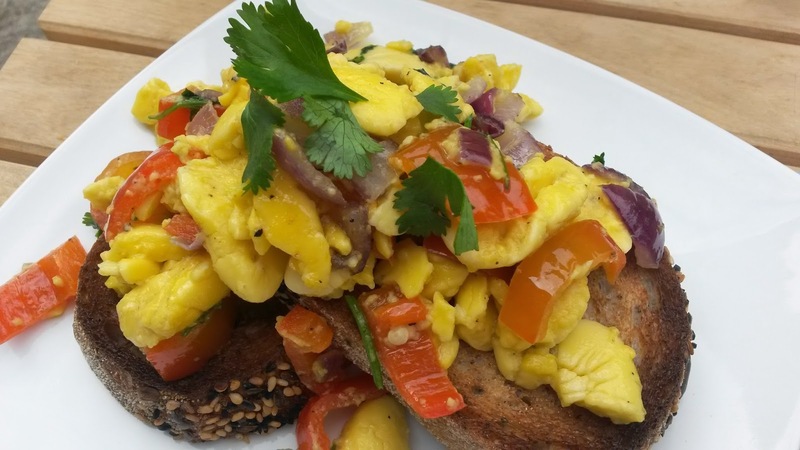 Traditionally served alongside salt fish, ackee also lends itself to vegan cooking very well. It's great in vegan quiches, and is a tasty filling in tacos and burritos along with rice and guacamole. But ackee really shines as a breakfast food, and serving it scrambled is my favourite way to eat it. It doesn't have a very strong taste, so I like to add herbs and other veggies for maximum flavour. In the UK you'll mostly find ackee canned in water or brine. Some branches of Asda and Sainsburys stock it in the world foods isle, or you can usually get it in your local Asian store. In the US canned is the only way you'll find it, as in its fresh form it is banned. Eating under ripe ackee, or consuming the pods or seeds can result in a very serious form of food poisoning, which can cause death if not treated- pretty serious stuff. But don't let that put you off! It's a wonderful food, and the canned version tastes divine in this dish, it really is my favourite breakfast and I'm sure you'll love it as much as I do. In a frying pan, saute he onion and garlic until softened in the oil. don't let the pan get too hot. When the onion is translucent, add the akee and red pepper. It only needs to cook for a couple of minutes as the akee just needs warming through, and I like the pepper to still have some crunch. Season with salt and pepper and pour the scrambled akee over the toast. Garnish with some fresh chopped coriander, this really lifts the dish!